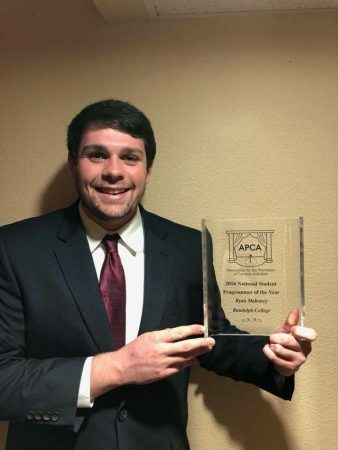 This weekend, the president of Randolph’s student-run Macon Activities Council (MAC) received national recognition for his efforts to host student events and bring performers and other entertainment to campus. Ryan Mahoney ’18 was named National Student Programmer of the Year by the Association for Promotion of Campus Activities (APCA). In the past year, Mahoney and his MAC colleagues have sponsored events like bubble soccer games, a paint party, a ping-pong tournament, and a lip sync battle. They have brought performers to campus like magician Matt the Knife, R&B vocal group Final Draft, pop rock band Hellogoodbye, and comedian Mike Paramore. MAC also sponsors annual events like Fall Fest and Outdoor Fest. This is not the first time MAC and its members have received national recognition. In 2014, the group earned the APCA’s Southeast Region Student Organization of the Year award.